I wonder if everyone who lives in Mexico goes through the same mad spending spree in the run-up to visit home that I do. You can take several different approaches on what to do with the money you save living in Mexico. You can keep it in the bank working for you, spend it on luxuries you may not be able to afford at home or blend the two models. Moving to Mexico was never about just saving money for me. It was about adventure, learning a second language and living better - perhaps even taking a little better care of myself. I calculated that having my recent root canal done in Mexico saved me at least $1,200. I had five appointments from initial consult to placing the new crown. The whole process cost $400 dollars. I’d venture to guess that aside for cleanings, most people don’t have dental work done until something hurts due to the cost. In Mexico, I can approach dental work more proactively. What once would have been a luxury; replacing old crowns and back fillings before they became a problem, I will be able afford now at the buzzing little clinic I found in Mazatlán. There are hundreds of such clinics thoughout Mexico. While I’m sure expat men have their own list of splurges (and knowing what I do about men, theirs are probably bigger), I decided to use some of the money I saved on the root canal to pamper myself with a few services I can’t afford at home. As I start whipping out the peso notes, cognitive dissonance fell over me once again at the bills with the numbers 200 or 500 on them. It still makes me run to the calculator, no matter how well I know the exchange rate (Two hundred pesos is a little over $10 dollars). First I set an appointment for hair coloring and highlights that cost $75 in Mazatlán and costs $200 (with tip) in Denver. In Mexico, you can find hair and beauty products not available in the U.S.
Next was a trip to the optometrist to pick up my contact lenses. The supply that runs at least $250 in the U.S costs $165 in Mexico. Plus, the Mexican optician, who spent an hour and a half getting my prescription so perfect a year ago, does not require a new eye exam to renew it. A few days later, I went to my dermatologist and bought a good number of jabs of botox around the eyes. I like that the procedure is carried out by a doctor, not a esthetician. She does a bang-up job. I have a sun damage around my ankles due to my over-the-top whiteness. My American doctor told me there was nothing she could do. Her only suggestion was a lotion for $80 a bottle that probably wouldn't work and would take three months of application to know if it did. While at my dermatologist’s office in Mexico, I also decided to take the bait for an elixir that she formulated up for the same condition. She said that so many of her patients came in with it, she decided to create her own treatment. Her brew, a clear liquid that you dab in the affected area twice a day, along with a spray cost $120 for a six-month treatment, making it an experiment whose cost I could live with. She conscientiously took pictures of my ankles before and after so I could monitor the improvement. She sells the products from her own little pharmacy off to the side of her office waiting area. The treatment and spray, with handwritten labels, are passed through windows that look like bank tellers. And of course, I had pharmacy runs to make. I stocked up on Latisse ($37) and Retin A. ($15), both available without a prescription here. Someday I predict pharmacy purchases will be of a more serious nature. For now, I’m enjoying being able to afford a little woman-in-full vanity. Anyone coming to Mexico should look up in Spanish the names of their favorite medications and ointments that they cannot afford in the United States or are not covered by insurance. Find out whether you can buy them over the counter in Mexico. Once you find what you want, it may take several runs to different pharmacies. Mexican pharmacies often don’t carry deep inventories. I suggest Farmacias Modernas, Farmacias Guadajajara and Farmacias Similares, the latter of which is the place to go for generic prices. Check prices in several pharmacies when in Mexico. Prices vary a great deal from place to place. On a more practical note, I also Ubered over and pre-payed my AT&T bill for the time I'll be away. My plan, which includes unlimited calling to and from Mexico and the U.S from either country, costs $10 a month here. Buying this plan, which is monthly with no contract saves me at least $840 a year from the Verizon plan I had four years ago. More important than the savings is the gratification of not being held hostage by an American major carrier in the U.S. If you make a trip to Mexico, you might want to think about stopping in an AT&T office and taking a look at the plan. Finally, I took the rest of my savings from the dental work and bought a beautifully sparkling turquois-stoned bracelet at the Sanborn department store for the daughter of a Mexican friend of mine who just graduated from college. Life in Mexico isn’t always easy. Even with good Spanish, the language factor wears you out some days. Other days, the internet doesn’t work. Life in Mexico isn’t always convenient. It’s rarely efficient. It was a big week spending all that money. I don’t feel guilty about a dime of it. Next up: The legend of La Malinche bleeds into the modern Mexican’s psyche…and my gift giving. Most recent: Pharmacies deliver in Mexico. If they did so in the U.S., what would they deliver? Kerry Baker is a partner with Ventanas Mexico and author of two books. 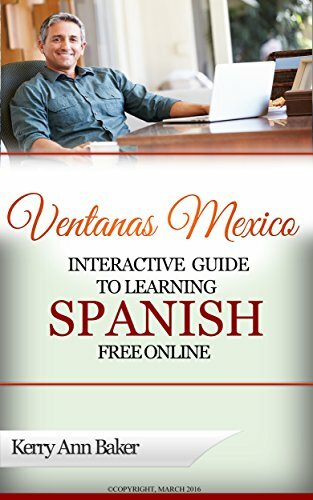 "The Interactive Guide to Learning Spanish Free Online" is a curation of the best free tools on the web for learning Spanish, organized into lesson plans with interactive links. You can use the lesson plans in the book, or create a new one every day from the resources and links in this book. Boredom is the biggest impediment to learning a new language. Use the tools to stay motivated. 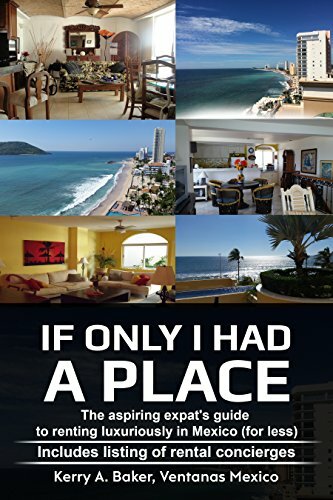 The second book, "If Only I Had a Place" is a guide to renting the most luxurious places in Mexico or less, and avoiding the pitfalls of renting in Mexico, where fewer legal protections exist. More than a how-to, this a guide to a rich expat existence.